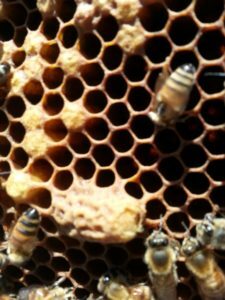 Queen cells are an important part of beehive success. Colonies create them to ensure colony health and reproductive potential, both internally and externally. Understanding what the queen cells represent when you see them if very important, as it will play a direct role in your colony management. In all of the cases, asking the Hive Inspection questions to ensure that you are making the right assessment. 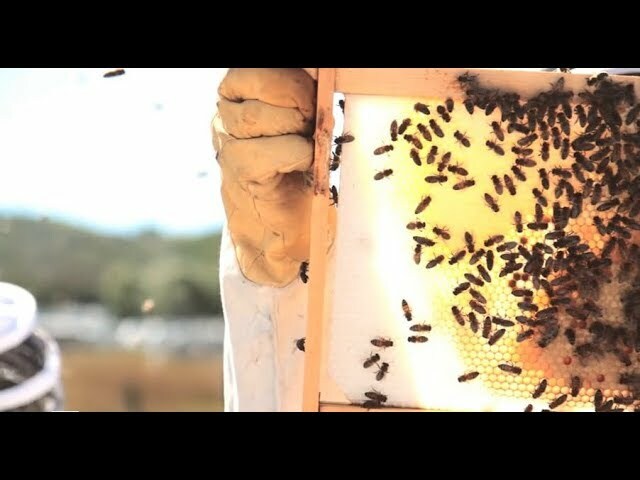 Swarm cells are queen cells that are created by a colony wishing to issue a full sized (more than 2lbs) colony out in to the environment with the parent colony queen. The queen cells are left to remain in the colony, hatch, and compete for leadership. The queen that is first to emerge commonly moves quickly to the capped queen cells, stings through the side of the cell, and kills the immature queen below. Also often, more than 1 queen will emerge and the two virgin queens will fight until there is a victor, she becoming the new matriarch. Less often, virgin queens, with their attendant retinue of bees that cared for her during development flee. This is called a cast off swarm. A cast off swarm will have a virgin queen and often is less than 2lbs, but depending on the strength of the colony, could be larger. Signs of queen replacement? How many queen cells and where are they located? If you are seeing more than 6 queen cells and they are placed near drone combs or in the periphery of the colony cluster, these are common descriptors of swarm behaviour. You honey bee colony, if strong and robust, values their queen. 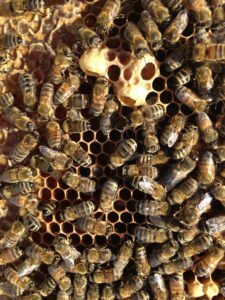 They will want to move queen cells out of the way of the parent queen to ensure that they do not disrupt her brood laying scheduled. Are you in increase or decrease? This is important. Many times, swarms and supersedures occur when the colony is aiming for strong build up of the brood nest, and a barrier comes in the way. In the case of swarm cells, commonly the issue is space. A queen can move from laying 800 eggs one day to 2000 another. It is imperative that the beekeeper become comfortable at observing eggs. A frame that looks empty, could indeed be filled with unhatched eggs in a matter of days. Are there signs of brood disease? A weak or sick colony rarely will swarm. Identify health in the colony. If you see signs disease and or illness, reflect again on the questions asked above. Supersedure cells are queen cells created to replace the current queen. She is showing signs of failure, this can be visible to the beekeeper or not, but in either case, the colony has decided to host an election. The parent queen could be dying or could be dead. Are you queen right? Is there visible brood within the cells? And at what ages in development? Poor laying or a decreased amount of brood laid can be indicative of production. Is the brood pattern consistent? Commonly in supersedure, you will be finding a colony with a decrease in brood production out of sync with the bell curve for increase (see hive inspection link), but you may also find the brood pattern disrupted. This could be a cause for a poor queen or signs of disease. Signs of queen replacement? Less than 8 queen cells and their location in the heart of the brood nest can be indicative of queen supersedure. The parent queen is pushed out of the heart of the brood nest, to make sure that the heat of the brood nest and the population of nurse bees that can best care for the future replacement queen electorate. Are you in increase or decrease? Supersedure usually takes place during periods of increase, although they can happen at any time. What you will notice is that if you are in a period of increase, you will notice that the colony is failing to grow as quickly as the bell curve suggests. Are there signs of brood disease? Many supersedure events take place because a failing queen leads to colony ailments. Seeing brood disease while also witnessing queen replacement can often be a helpful indicator of the queen cell creation motivation. Emergency cells are queen cells created during times of stress, caused by a late awareness by the colony that the queen is failing or has completely failed. Emergency queen cells are made from hatched worker cells that have had a meal of conventional worker brood food. So, when the colony has become aware of the failed queen, they move to the youngest brood found in the colony, begin feeding it royal jelly. A unique characteristic of an emergency cell is its design. Because the future queen is developed out of hatched worker egg, the young larva is too tender to be moved in to an appropriate queen cell. 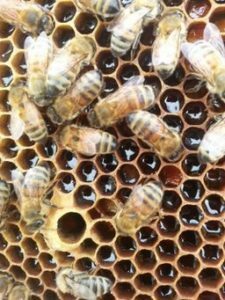 Therefore, the workers will plunge the cell with royal jelly, elevating the growing larva to the edge of the cell, allowing it to develop as a queen cell on the outside of the face of the comb. Therefore, cells tend to be small. The problem with emergency queen cells? Because the hatching queens have received a diet of brood-food, the new queen is not a full queen. As soon as she is able to go on her nuptial flights, come back and lay female eggs, most colonies will move in to creating a supersedure queen. How do you know the queen cells are emergency cells? Queen right? It is common that there will be no living queen, and that eggs will not be able to be found. with all of them scattered in the youngest part of the brood nest. Is the brood pattern consistent? Emergency cells are symptomatic of a weak and failing colony. It is rare that a quality brood pattern would be found with an emergency queen cell. Signs of queen replacement? Seeing the quantity of queen cells and their location. Queen cells tend to be 1-3 cells, and all within the location with the youngest brood. Increase or decrease? Common indicators for emergency cells correlates with the volume of bees found within the colony. 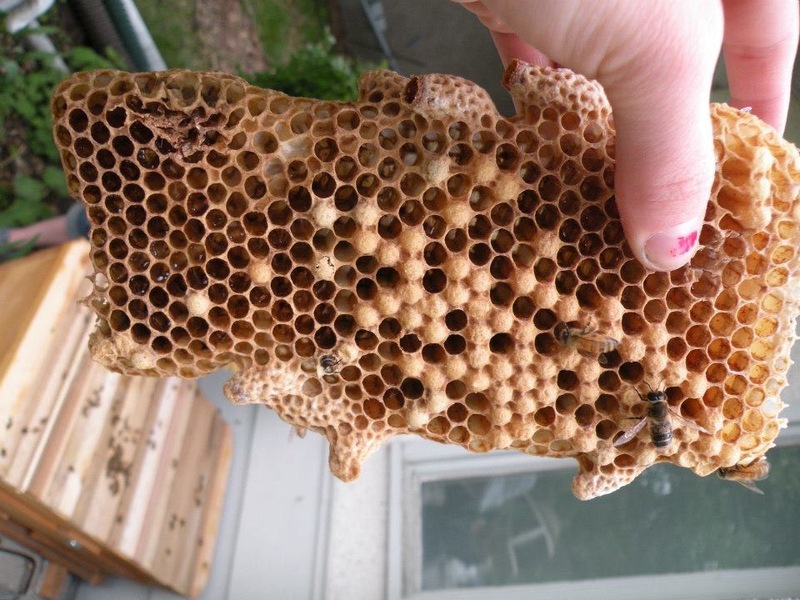 Less than 2lbs of bees, found most often coming out of winter, is a common cause for emergency queen cells. Keeping an eye on the whether the hive is increasing in size, as well as whether there are enough bees to support this taking place. Are there signs of brood disease? If a colony is in a weakened state, the cause could be pathogenic . It is important to be VERY inquisitive of the colony and equipment health. Knowing what you have, in the colony, is key to ensure what management strategies are required to ensure that the colony keeps growing and remains healthy… and you are not left chasing the bees down the street! For more information about beekeeping, how to learn new skills in beekeeping, intermediate and advanced as well, contact us at www.abcbees.ca, and see what programs and courses we have running!